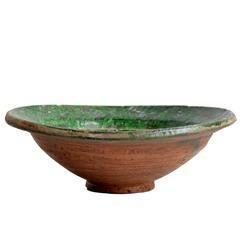 A stylish small bowl or vide-poches in glazed ceramic, with a pebbled texture and glossy finish. 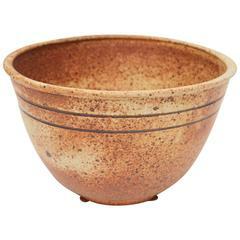 The lip of the angled, footed bowl has been cut in three places and each section rolled under to create a wrapped, tricorn effect. Marked on foot with a small stamp and the number “167.” Condition: Excellent vintage condition. Dimensions: 8.25” length x 8.25” width x 5” height. 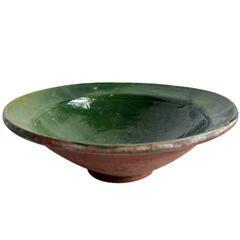 Glazed Ceramic bowl, stamped on underside Holland. 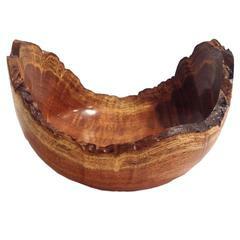 This natural edge mesquite wood bowl was handcrafted by James Krom. No bark is included in this piece. Signed item. 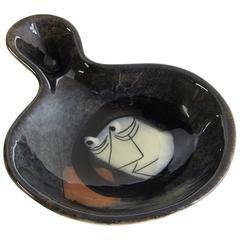 Round ceramic bowl with decor of houses and tree. Can be hung on the wall or used for fruit etc. This 1970s signed art pottery has a great shape with a variegated hand-painted glaze and splatter pattern. 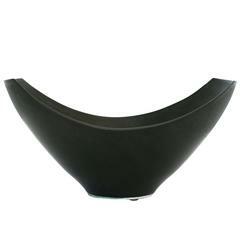 The bowl also has two thin carved lines accentuated by a dark color. A signed Polia Pillin ceramic bowl depicting horses. 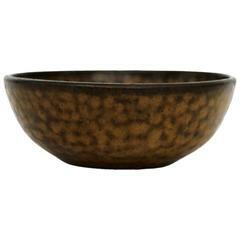 Striking midcentury artisan crafted ceramic organic-form footed bowl, circa 1950s-1960s. 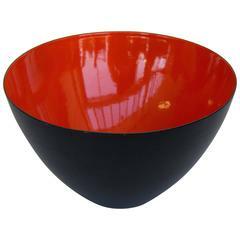 This hand thrown bowl is fired in a black glaze with a vibrant red interior.